Join our online community of over 14,000 climbers. Receive two free issues with your paid two-year subscription to Alpinist. Backcountry's January Issue is on sale now. We ice climbers spend a lot of time in solitude. For us hiking home under a flickering headlamp is not usually a warm experience. Unlike rock climbing where friendly climbers congregate on warm crags, ice climbing is cold, dark and lonely. This is why we have ice climbing festivals. For one weekend out of the year, everyone can have something in common: Ice. We laugh at inside jokes, share beta and dream about what we would do with the perfect conditions. And weeks later, when hiking out in the dark, we don't feel alone. Alpinist recently sat down with Joe Josephson author of Alpinist 31's Mt. Logan Profile and organizer of the season's first rodeo, the Bozeman Ice Festival, to discuss what makes these events so special. Whether you live in Colorado (Ouray Jan. 6-9, Lake City Feb. 19), Vermont (Smuggs' Jan. 29-31), Wyoming (Cody Feb. 18-21), New York (AIM Jan. 14-16), New Hampshire (Mt. 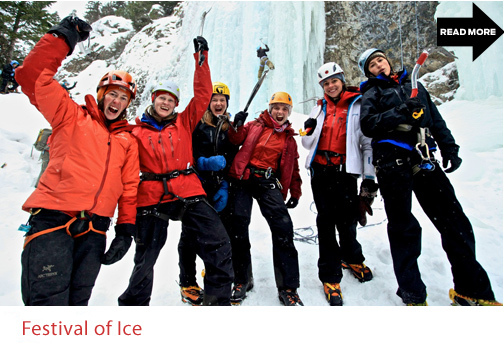 Washington Feb. 4-6) or anywhere else in the world, know that there are others who understand the joy of climbing ice. Click in to read more about the 2010 Bozeman Ice Festival.